Civilizations have been producing olive oil for thousands of years. In the most simple terms, olive oil is the consumable liquid extracted from crushed olives. Traditional methods of obtaining olive oil date back to ancient times and the process didn’t change very much until the 20th century. Today, production technology is becoming more and more advanced, allowing suppliers to provide better quality olive oil than ever before. Olive oil starts in the groves where olives grow on trees before being harvested. Traditional olive groves often contain trees that are hundreds of years old, spaced far enough apart that the branches expand broad and wide. These trees were typically harvested by hand, and today are harvested with a combination of people and tools such as handheld shakers, nets and tractors, depending on the landscape. In the last few decades, new plantings typically opt for a more efficient high-density layout where the trees are closer together in order to allow faster harvesting using mechanical harvesters such as the trunk-shaker and umbrella-style catcher. The newest type of grove is a Super High Density layout where trees are planted hedgerow style and can be harvested very quickly using a machine that drives over the top of the trees and catches the olives on a conveyer within the unit. In the Northern hemisphere, including the Mediterranean basin, the harvest runs from October through the following January, depending on the weather, region and olive variety. In the Southern hemisphere the harvest runs from April through July. 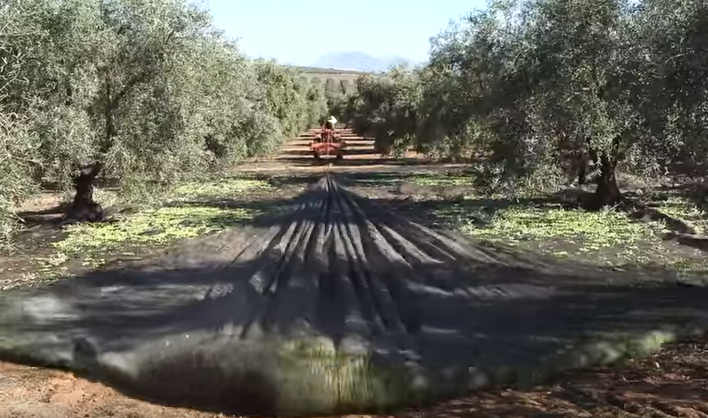 First the olives are separated from any branches, leaves or debris and sprayed or washed, but only with water. Next the olives are crushed to form a paste. Traditionally this was done with stone crushers, but modern machines such as hammer mills and grinders have replaced stones today. After crushing, the paste goes through a malaxation phase which basically stirs the mixture in preparation for extracting the liquids. At this point the solids and liquids, including both water and oil, are separated from the paste. From the 17th century until as recently as the 1940s, extracting the liquids was accomplished with an olive press that would squeeze the paste on baskets or mats to press out the liquid. Today, millers rely on advanced decanting and centrifugation machines which help gravity work more quickly by spinning the mixture to generate the separation. After the initial liquids are separated from the solids a vertical centrifuge can separate any excess water from the oil. Lastly, excess sediment is usually removed from the oil within 24 to 48 hours before the oil goes to its final storage tank. Oil that meets the International Olive Council chemical and sensory criteria for Extra Virgin Olive Oil or Virgin Olive Oil is now ready to be blended or bottled. Oil with chemical or extreme sensory defects is refined to remove negative odors and flavors. Refined olive oil is blended with virgin or extra virgin olive oil to add flavor and antioxidants back before being sold as Olive Oil.